Today in Masonic History Robert Edward Coontz passes away in 1935. Robert Edward Coontz was an American admiral. Coontz was born on June 11th, 1864 in Hannibal, Missouri. Notably his parents were neighbors and schoolmates of Samuel Clemens (Mark Twain). This would not be Coontz only connection to Clemens. In his youth, Coontz carved his name into the wall of McDowell's Cave, later renamed to Mark Twain Care because it was featured in the book The Adventures of Tom Sawyer. After attending public schools in Hannibal, Coontz attended Inglesile College for a year and then Hannibal College for a year. Coontz then asked a family friend who was also the United States Senator from Missouri for an appointment to the United States Naval Academy. There were several other young men who had already requested the appointment so a competition exam was setup and Coontz won the appointment. After graduating from the Naval Academy in 1885, Coontz served in the Navy Department. Over the next decade he served on a variety of ships, largely in Alaskan waters and the Great Lakes. He served on board the USS Charleston during the Spanish-American and was part of the crew when they seized Guam. From 1907 until 1909, Coontz sailed with the "Great White Fleet" a show of American Naval force when President Teddy Roosevelt sent the fleet on an around the World cruise. 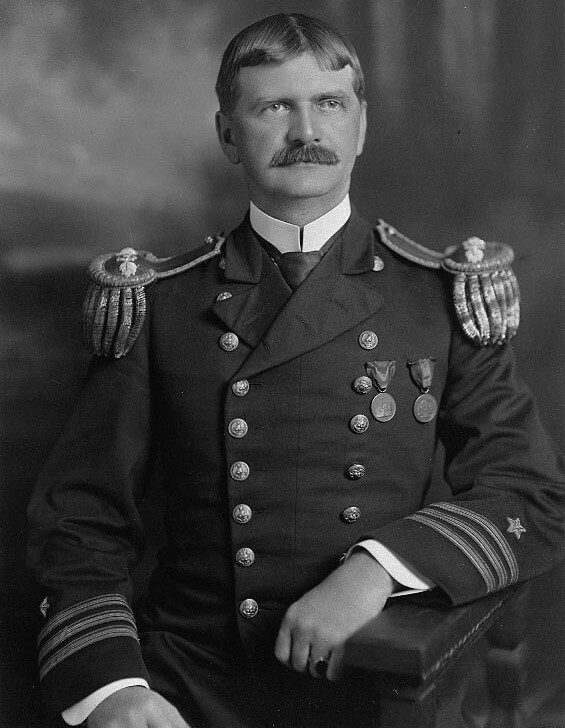 Upon the Great White Fleet's return in 1909, Coontz was promoted to Commander and made Commandant of Midshipman at the United States Naval Academy. From 1912 to 1913, now a captain, Coontz served as Governor of Guam. Prior to 1919 he was promoted to the rank of Rear Admiral. In 1919, Coontz was selected to become Chief of Naval Operations (CNO). It was a turbulent time for the United States Navy coming out of World War I. This included diplomatic attempts to limit the size of the Navy, constant pressure to economize and the Teapot Dome Scandal, where the Secretary of the Interior sold the rights to Naval oil reserves at Teapot Dome in Wyoming. He was relieved in 1923 and was made Commander-in-Chief of the United States Fleet. In 1925 he led the fleet on a trans-Pacific visit to New Zealand and Australia, much like the "Great White Fleet" twenty years earlier, this was meant as a show of America's naval power. He also lobbied to convert two battlecrusisers in aircraft carriers when the Washington Naval Treaty was signed by the five powers that won World War I. The treaty was meant to prevent an arms race between the five nations. After Coontz retired he wrote two memoirs the first titled From the Mississippi to the Sea and the second True Anecdotes of an Admiral. Coontz passed away on January 26th, 1935. Coontz was a member of Naval and Military Lodge No. 206 in Bremerton, Washington. He was also a member of Olympia Chapter No. 27 Royal Arch Masons. He was a member of Albert Pike Consistory in Washington, D.C. and received his 33° in 1931. He was also President of the National Sojourners.